I’m always looking for new ways to incorporate veggies and salads into my meals. 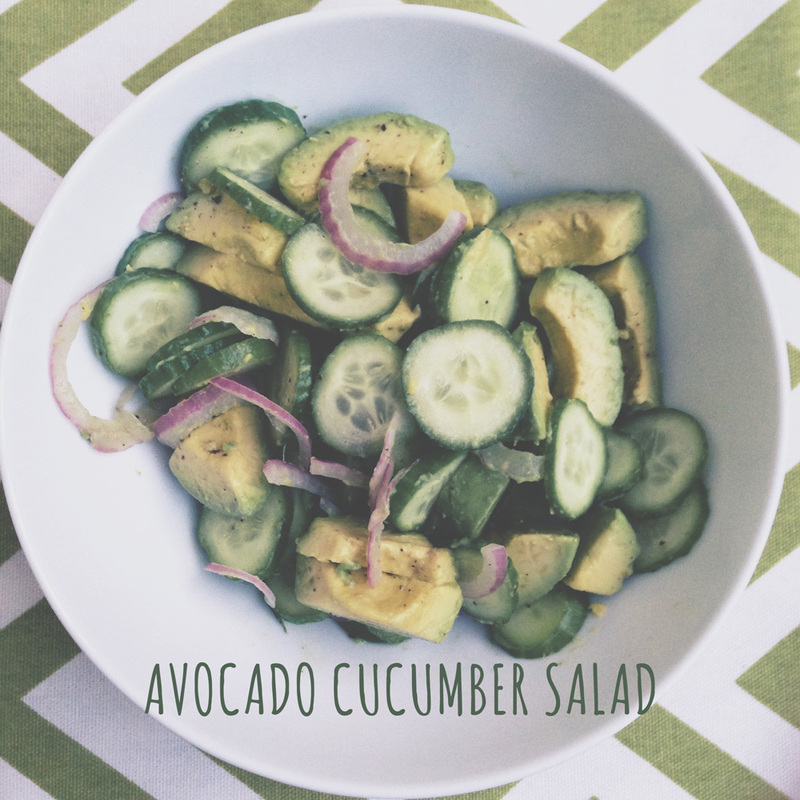 And this avocado cucumber salad is a perfect fresh element to add to any paleo/gluten-free meal. I first had this dish on an island in Guatemala. My family was vacationing on an island resort surrounded by manatees. One night the the power went out on the whole island while we were at dinner. But dinner service didn’t stop. The first thing they brought out was this cucumber salad. It tasted delicious, even without seeing it! I’ve modified the recipe a bit since then—merely because I love avocados as an added taste and texture for the salad. Anytime you use a raw onion in a dish, it adds a certain level of assertiveness to your dish. I don’t prefer that attitude in a salad like this, since there’s also some pretty harsh lime flavors. That’s why I marinate the salad a bit before serving. Start by thinly slicing your red onion until you have as many individual slivers as you will have cucumber slices. Put them in a bowl with the juice from anywhere to one half of the lime to the whole thing. Let that sit a bit so the acid works out some of the harshness of the raw onion. (about an hour) Then simply slice your cucumbers to the thickness of quarters or nickels. Add it to the mixture and toss a bit, adding some salt and freshly cracked pepper (about a teaspoon). Right before you serve the salad, add some chopped chunks of avocado and lightly toss. Be careful not to turn it into guacamole. (Do this last to keep the avocado from getting brown before you serve it.) Trust me, this dish is delicious. And it adds a great fresh element to anything from fish to latin cuisine.